You’re happily chopping onions for your dinner when BAM! Your eyes are stinging, and tears are running down your face. Maybe the burning gets so bad you have to step away! Why are onions such jerks sometimes? Well, it actually comes down to some pretty fascinating biochemistry. Before it found its way into your kitchen, the onion plant was happily making food from the sun and absorbing minerals from the soil. It turns out that onions are particularly good at absorbing sulfur, which they use in a number of amino acids. When you cut an onion, you break open cell after cell, releasing their liquidy contents. Previously separated enzymes meet the sulfur-rich amino acids and form unstable sulfenic acids, which then rearrange into a chemical known as syn-propanethial-S-oxide. 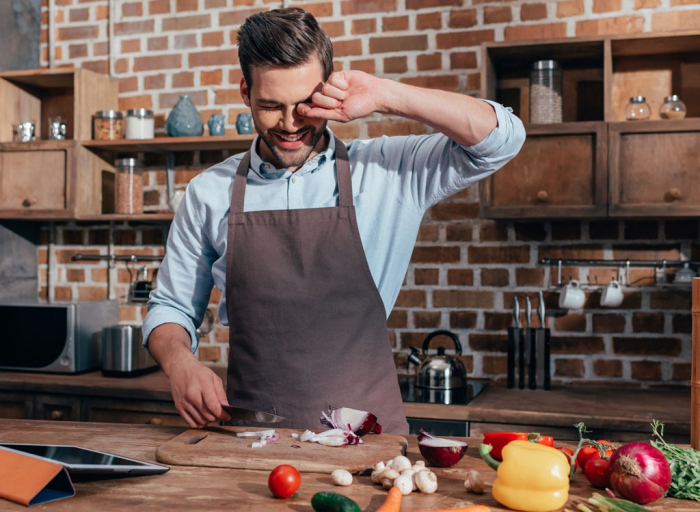 This sneaky chemical is volatile, meaning it easily vaporizes, and causes a burning sensation when it floats up from the cutting board and comes in contact with your eyeballs. In an attempt to keep your precious eyes from being damaged, your brain quickly triggers a tear response to rinse the offending irritant away. You are left with red eyes and tear-stained cheeks in the middle of your kitchen, the obvious victim of some (awesome) botanical warfare.